Borg El Arab is an industrial city in the governorate of Alexandria, Egypt. It is located about 45 kilometers south-west of Alexandria and some seven kilometers from the Mediterranean coast. 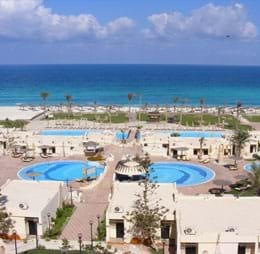 North of Borg El Arab is the King Maryut resort and Lake Maryut. Borg El Arab is widely considered an extension of the city of Alexandria. Book your Borg El Arab flight tickets at Rehlat and save big on your flight bookings. Rehlat is Middle East’s fastest growing online travel companies with over 1000+ airlines listed. Sign up for the newsletter and be the first to know about exciting offers and last minute deals. Discover the historical beauty of Alexandria with some wonderful attractions such as Bibliotheca Alexandrina, Stanley Bridge, Alexandria National Museum, Catacombs of Kom ash-Suqqafa, Ottoman Houses, Fort of Qaitbey, Kom al-Dikka, Pharos Lighthouse of Alexandria, Coptic Orthodox Partiarchate and Unknown Soldier Square. Borg El Arab city enjoys a great variety of shopping options. Travelers can find many local stores and mega malls in the city. The downtown of the city is the hub for many stores, selling Antiques, clothing, health & beauty, home furnishing, books & music, and jewelers. You will enjoy the shopping experience in the city as the collection and varieties are compelling and reasonable. There are numerous restaurants ranging from casual to fine dining are sprawled around the city to facilitate the crowd. Conversely, you can find many authentic restaurants serving Japanese, Chinese, Mexican, American, Italian and many more cuisines. So, you can enjoy the time with great joy. You can find a vast number of trains, buses and taxis to travel from centre of the city to Cairo in the South, Mersa Matruh, Siwa and the Libyan border to the West and Sinai to the East. It will take around 3 to 4 hours to travel from Borg El Arab to Alexandria. A Number of black and yellow taxis are available in Borg El Arab. It will be of great experience to make longer journeys around the city. Borg El Arab International Airport is one of the airports in Alexandria, Egypt. Borg El Arab Airport Alexandria has been a link between Alexandria and many countries that are throughout the Middle East and North Africa. It provides all the latest conveniences for business travelers and tourists. It also provides cargo handling facilities. The airport is located about forty km southwest of Alexandria and has a new traveler terminal as well as an office building. The passenger wing is contemporary and clean and has three stories. The local transport companies operate several numbers of buses and taxis to travel from Borg El Arab Airport to Alexandria. The private companies operate a large number of taxis from the heart of the city to Alexandria Airport with reasonable prices. It will take approximately 44 minutes via Axis Reconstruction to travel from Borg El Arab Airport to Alexandria, which is about 50 kilometers via Axis reconstruction. Europcar services provide excellent service for car rental in a large number of locations.